Woman Cave Scroll Saw Pattern. 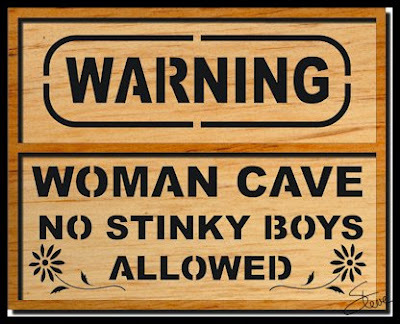 Woman cave sign. 10" X 8". This would be best cut from 1/4" Baltic birch plywood. Information: The Woodworking Show, Atlanta. I just wanted to remind everyone in the Atlanta area. 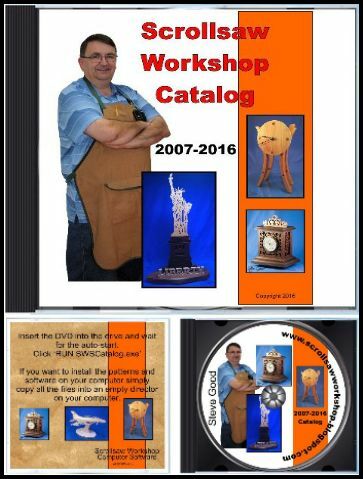 I will be a guest of the Gwinnett Woodworkers Association at The Woodworking Show March 31 - April 2 2017. If you are in the area I would love to have a chance to meet you. 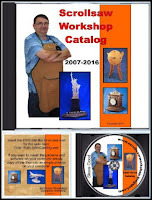 I will be in the Gwinnett Woodworkers booth each day. Please stop and say hi. This is tentative but I think I will be able to have one of the soon to be released Seyco Scroll saws that everyone is waiting to see, at the show. I'll be getting a pre-production demo model very soon. I have permission to bring the saw to the show. We just have to work out the details. I'm pretty sure I will have it in time. This alone would be worth coming to the show for. 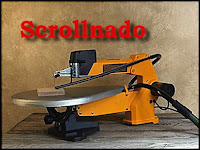 The Seyco Scroll Saw has the potential to be a very significant player in our hobby. Anyone looking to upgrade their saw in the near future should wait for the details on the Seyco Scroll Saw before you make a purchase. We are hopefully going to see the machine shipping in April. I will have a comprehensive review of the machine just as soon as I can put some hours on it. 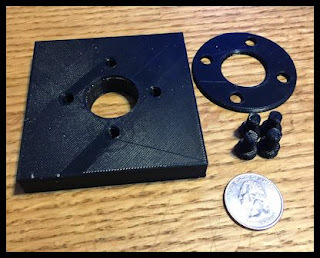 I have heard for several of you who have purchased a 3D printer recently. When I come up with handy woodworking/scroll saw related parts I'll share the files here on the blog. If anyone would like the 3D printer files for this Quarter cutting jig just email me and I'll set up a download link. The coin sits on a lip in the cutout. It is held in place by the round flange and the four screws. 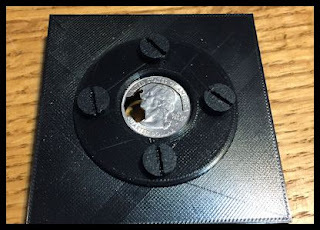 The quarter sits a couple thousandths above the cutout. This helps keep the coin from spinning while being cut. If you push hard enough it will spin a little sometimes. If you let the blade cut without pushing it will not spin. The plastic screws are 1/4" 20 so they can be replaced with off the shelf screws. The PLA plastic is decently strong but I may try to get this milled in aluminum. 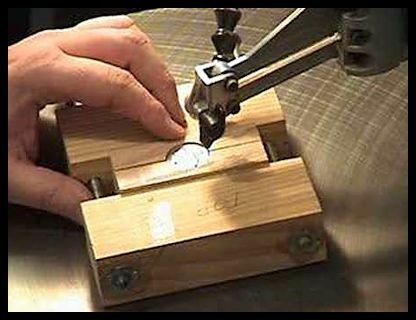 I don't cut too many coins but this jig is much easier to handle that the old wooden one I have been using. If I do aluminum I'll have to put something on the bottom to keep it from marring the table. 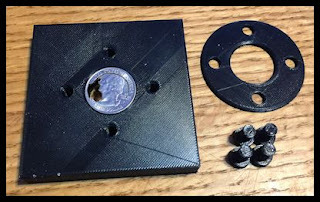 This 3D printed jig replaces my old wooden jig that was much larger and more difficult to handle. 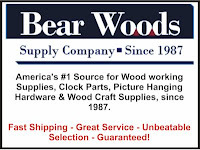 I will be starting another Bear Woods gift certificate giveaway soon. Keep your eyes open. I heard for another satisfied buyer of the Scrollnado dust collection system today. I have this installed on one of my DeWalt saws and it works amazingly well. The dust is collected above and below the table for the most efficient dust collection possible. If you have one of the DeWalt or Delta models this my be just what you are looking for.